45mm polished and satin-finished black ceramic case Forbidden X logo engraved solid back,, brown ceramic bezel with 6 H-shaped titanium screws, sapphire crystal with interior and exterior anti-reflective treatment, real tobacco leaf dial with black counters, red chronograph hand, ForbiddenX logo at 12 o'clock, self winding HUB 1143 movement with chronograph function, approximately 42 hours of power reserve, tobacco-colored calfskin sewn onto black rubber strap with black stitching and Forbidden X, deployant black PVD steel buckle. Water resistant to 50 meters. 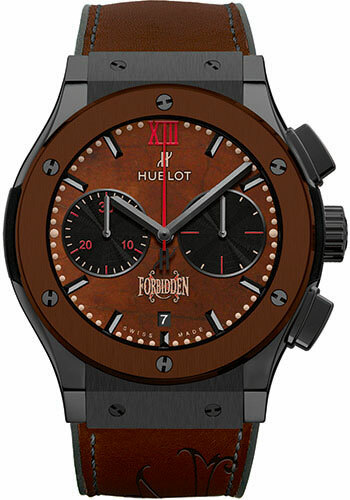 45mm polished and satin-finished titanium case Forbidden X logo engraved solid back,, brown ceramic bezel with 6 H-shaped titanium screws, sapphire crystal with interior and exterior anti-reflective treatment, real tobacco leaf dial with black counters, red chronograph hand, ForbiddenX logo at 12 o'clock, self winding HUB 1143 movement with chronograph function, approximately 42 hours of power reserve, tobacco-colored calfskin sewn onto black rubber strap with beige stitching and Forbidden X, deployant steel buckle. Water resistant to 50 meters. 45mm polished and satin-finished 18K King gold case Forbidden X logo engraved solid back,, brown ceramic bezel with 6 H-shaped titanium screws, sapphire crystal with interior and exterior anti-reflective treatment, real tobacco leaf dial with black counters, red chronograph hand, ForbiddenX logo at 12 o'clock, self winding HUB 1143 movement with chronograph function, approximately 42 hours of power reserve, tobacco-colored calfskin sewn onto black rubber strap with beige stitching and Forbidden X, deployant 18K red gold buckle. Water resistant to 50 meters.